For over 50 years, Peterson Real Fyre Gas Logs have manufactured premium quality gas logs that create a natural wood-like fire with maximum ease, efficiency and economy. Real Fyre Gas Logs are crafted in the USA and come with a lifetime warranty. Real-Fyre Gas Logs are manufactured to exacting specifications and the highest standards by R. H. Peterson Company. All Real-Fyre gas log sets are detailed with premium quality, high definition bark, and natural colors for authentic wood realism. Many also have hand-painted highlights that match natures beauty and variety. Peterson Real Fyre Gas Logs burn cleaner than smoke-producing wood fires, reducing pollution. Their beauty and warmth provide comfort and pleasure for as long as you own your home. Peterson vented gas logs & vent-free gas logs becomes the focus of any home as it always presents an attractive log stack. 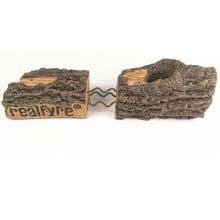 Texture and visual impact mark Real-Fyre Gas Log sets. For use with natural or propane gas, these premium gas logs invite fireside warmth. Steel Reinforcing Rods - To further add to the integrity of Peterson Real Fyre Gas Logs, precisely sized and designed steel rods are inserted into each log. This provides maximum reinforcement and prevents breakage. Greater compressive strength - Allowing finer detailing in the log making process without breaking or chipping, and producing a longer lasting log. Higher bulk density - Providing more radiant heat, both while in operation, and after the set has been turned off, especially when compared to gas logs made with vacuum formed fibers. Better rheology (flow rate)- Meaning a better texture to the logs, fewer bugholes, better strength, and less water in the mix, for better consistency of product. Higher refractoriness - Our refractory material has a Pyrometric Cone Equivalent of 2650 degrees (F), higher than any other log and higher PCE means better ability to withstand heat over time. Our logs won't break down. Lower iron content - Other materials have 50-900% more iron! Iron turns to iron oxide and changes the color of logs. Real-Fyre Gas Log Systems are accepted by most national and local building codes and authorities, and are available with one or more of the following listings or certifications: C.S.A., C.G.A., R.A.D.C.O., I.C.B.O., B.O.C.A.